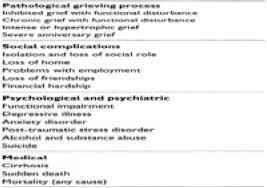 The main diagnostic challenges are to identify pathological grief, and to identify other mental disorders provoked by bereavement ( Table..?). • delayed grief—the avoidance of painful symptoms within the first 2 weeks of a loss. An unusually intense bereavement reaction is sometimes described as hypertrophic grief. There is some evidence to suggest that this form of grief may predispose to psychiatric comorbidity. An alternative way of defining pathological grief is to consider whether it is associated with significant functional disturbance, and secondly to consider whether it is unduly persistent. These two interact. Thus, severely distressing or disabling symptoms at 2 months, moderate symptoms at 6 months, or mild symptoms at 12 months could all reasonably justify a diagnosis of pathological grief. Depressive disorders are commonly provoked by bereavement, but depressive symptoms are also a part of the normal grieving process. Symptoms tend to occur most frequently within the first 4 months and decline rapidly with time. The proportion of people who continue to satisfy the criteria for a depressive episode declines with time. • hallucinations, except in relation to the deceased. 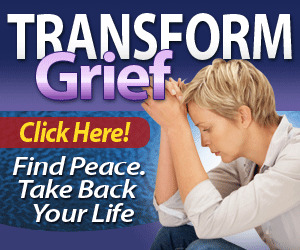 Another approach is to consider the psychology of the bereaved person. Cognitive distortions involving self, world, and future (Beck's triad) are suggestive of depression, whereas periodic preoccupations are a core feature of grief. 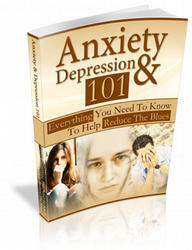 Although less studied than depression, anxiety disorders may also occur after bereavement. The possibility of post-traumatic stress disorder following bereavement should be considered, especially when a death is sudden, unexpected, or violent.